This year’s California Air Quality Awards Honoree, Vic La Rosa, founded Total Transportation Services, Inc. (TTSI) in 1986, with the goal of creating a customer-focused business that makes a difference in the trucking industry. TTSI distinguished itself early on by its commitment to sustainable practices and by fostering a company-wide awareness of the urgency to reduce diesel emissions. 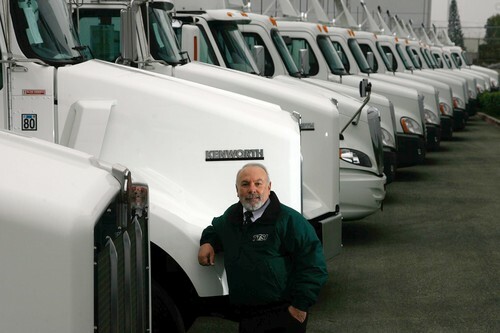 Vic has tested and put in operation every single type of heavy-duty truck available and has set himself the ambitious goal of converting his entire fleet to zero or near zero emission vehicles by 2020! Why is this important? Despite the fact that heavy duty trucks are only 2% of the vehicles on the road, they emit 50% of the cancer-causing particulate matter on California’s roads. They consume one-quarter of all the fuel we use and produce nearly one quarter of the greenhouse gasses in the U.S.. In greater Los Angeles, people living in close proximity to truck routes experience much higher rates of asthma, cancer, heart disease, and a growing list of health concerns. While there has been much talk of a zero vs. near-zero solution to cleaning up our freight sector, the truth is 97% of heavy-duty trucks on our roads run on either diesel or gasoline. Thus, we need to recognize the important contributions of those who are leading the way in adopting new technologies to move us toward a cleaner freight future. Given the growth projections (the San Pedro Bay Ports had their busiest year ever in 2016) no amount of new diesel technology will offset the emissions from that growth. Near-zero and zero-emission truck options give us hope that we can have a clean air future. Vic La Rosa is a valuable partner in achieving this goal. Even better, he considers himself “agnostic” when it comes to technology. He understands clearly that the market is dominated by outdated diesel vehicles and feels there is room for all available clean technologies like renewable natural gas, hydrogen, battery or fuel cell technology. Like us, Vic hopes that the technology providers will come together to remove diesel trucks from California roads so that we can start making progress toward a clean air future! We’re going to clean up the trucks that use the ports, rail yards and warehouses and Vic is the guy who’s making that happen.